Workplace wellbeing is not a secret concept and has been on the agenda for many years. However, once discounted as a fad or trend, it has more recently become rooted in business strategy for companies of all sizes, operating in all sectors. The reasons are straightforward as repeated studies have shown that a focus on employee and workplace wellbeing can result in improved productivity, increased morale, less sick days and better staff retention. No wonder companies have embraced the workplace wellbeing concept with such vigour. But what is workplace wellbeing and how can office design as a discipline create spaces that promote and encourage workplace wellbeing? “That part of an employee’s overall wellbeing that they perceive to be determined primarily by work and can be influenced by workplace interventions.”. 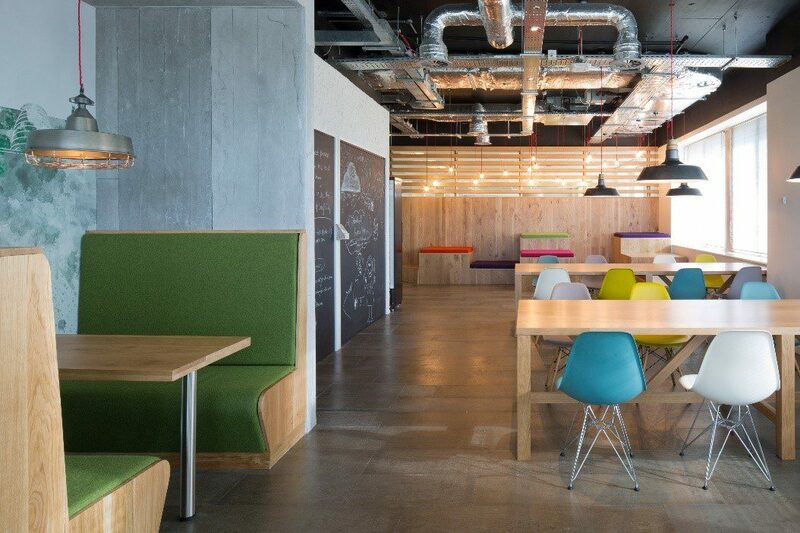 So how can office design create spaces that promote wellbeing? Here are some of our thoughts. The days of spending 8 hours labouring at a designated desk are over, extinct bar the exception of some traditionalist dinosaurs – “The desk is dead, long live the desk”. Today, office design provides a variety of work settings, allowing staff to choose where and how they want to work. This can manifest itself in breakout spaces designed for informal catch-ups, team collaboration or simply for a quiet coffee, to private spaces designed for concentrated working where people won’t be disturbed to phone booths for taking confidential phone calls. Of course, the desk is still a space where a lot of work is performed with the main evolution being that it is no longer the only place employees can work. This introduction of choice has not only mental and psychological advantages that aid improved wellbeing, it also promotes greater movement and less sedentary working which is fundamental to workplace wellbeing. 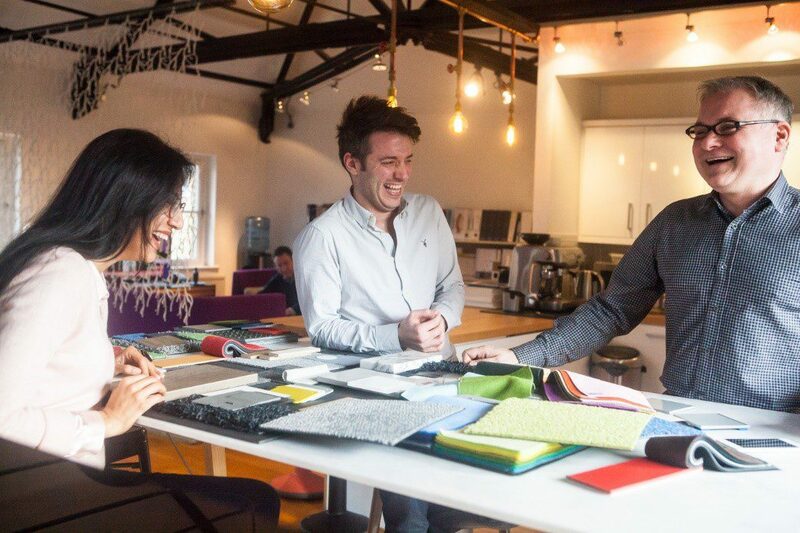 Our Office Design Matters eBook focuses on how choice and empowerment can have a positive impact on the workplace and staff wellbeing – well worth a read (Even if we say so ourselves). Increased movement is paramount and with all the discussions around sitting being the new smoking, many designers and companies are introducing sit stand desks for staff, allowing them to change from sitting to standing in a matter of seconds. Only a couple of years ago, these sit stand desk solutions may have proved too costly for many but today, there is a vast selection of products to suit all budgets. Standing while working for just 30 minutes a day can have a remarkable impact and can decrease blood pressure, cholesterol and stress levels – our team have penned an entire article on the benefits entitled The Rise of the Sit Stand Desk, which is worth a read. Standing meetings have also risen in prominence and while share many of the same benefits as the sit stand, are also said to be a more efficient form of collaboration. Consequently, office designers now look to include tall working benches in most if not all workplaces to facilitate these meetings. Often an afterthought, lighting can play a crucial role when it comes to workplace wellbeing. From an office design perspective, incorporating and utilising as much natural light as possible is recommended, but it is also important to adopt a lighting strategy for areas designed for distinct types of work or activity. For example, a lighting strategy should dictate that when at their desk, staff will need approx. 300 Lux, while breakout spaces should be less at approx. 150-200 Lux. Lighting affects mood and as a result can impact productivity and wellbeing, so ensuring your office design has a well thought through lighting strategy is worth considering. Colour like lighting can have a major impact on mood with certain colours supposedly imparting everything from a sense of calm to dynamic creativity. There has been much written about the psychology of colour in the workplace and up to just a few years ago, the norm was to select soft tones for workplaces, but much has since changed. Today, office designers aren’t afraid to embrace colour and in relation to wellbeing, some colours such as blues and greens can support a sense of calmness and wellbeing. Brighter, louder or higher wavelength colours more associated with the home have also made their way into the mainstream workplace with a slew of reds, oranges, yellows and purples no longer the exception they once were. Colour can be injected not only via paint but also through the selection of colourful furniture, the addition of manifestations and/or graphics or even carpeting. 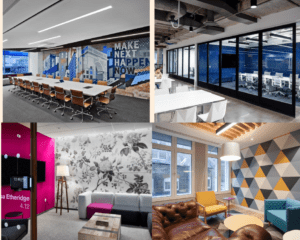 Our advice is to work with your office design team to select a palette that works for your brand and space and don’t be afraid to select some bolder, louder tones. 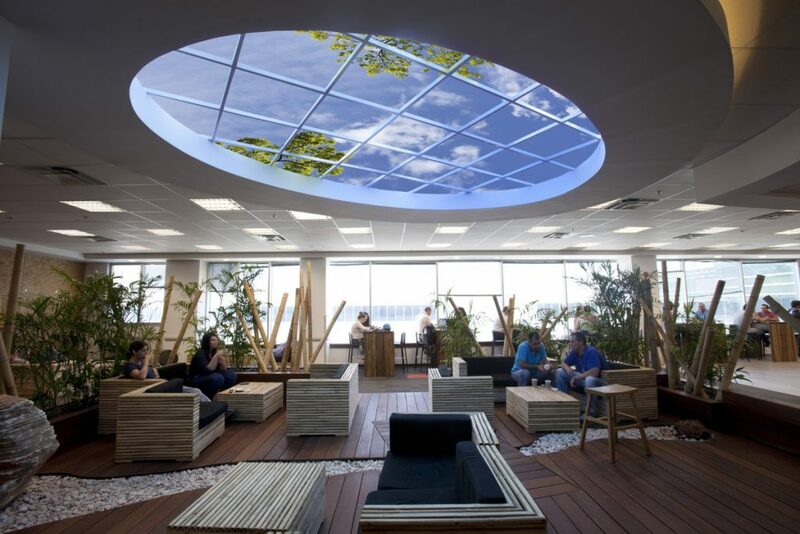 As human beings, we are inexplicably drawn to nature and Biophilic Office Design, a concept that advocates bringing the outdoors into the workplace has risen significantly in popularity. 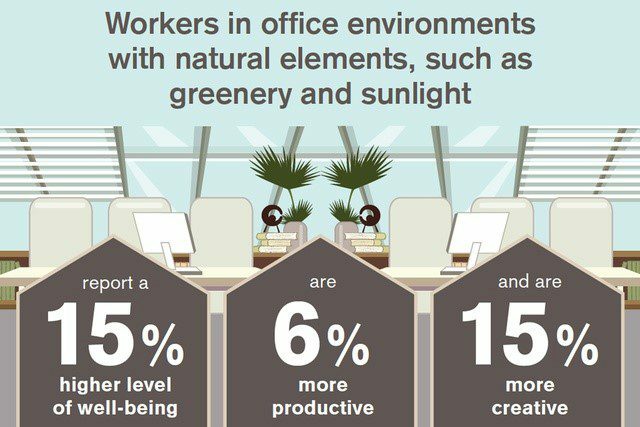 Workplace wellbeing and office design overlap at this juncture (and at many more) as an increasing number of companies seek to introduce plant life and natural elements to their offices. 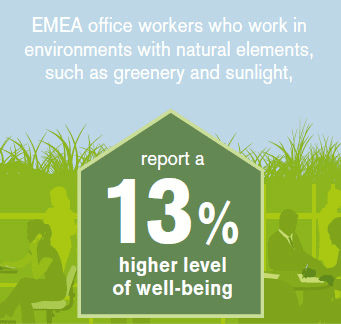 The reasons for this surge in enthusiasm for all things nature is down to the fact that by introducing plant life and shrubbery into the workplace, oxygen levels increase and result in increased concentration levels, improved moods and critically, greater productivity. Our nature loving design team have also penned a dedicated article on Biophilic Office Design which is well worth a read if you would like to find out more. We are witnessing more and more companies asking for bike storage, changing rooms and shower facilities to be included as part of their workplace. This can prove to be a quick workplace wellbeing win if the required space is available as more and more staff use two wheels to commute while lunchtime runs and trips to gym are certainly becoming more frequent. Our advice when designing your new space is to bear in mind how many people cycle to work and how popular showering/changing facilities are likely to be. Also look at introducing some games like table tennis, table football or pool to the workplace as they allow staff to unwind and their minds to re-calibrate, ensuring they stay fresh and motivated. Office design doesn’t need to be all about function, it can be playful too and introducing games can have a massively positive impact. On the rise also, is Yoga in the workplace where large meeting spaces are reconfigured to become proxy yoga studios while many companies are now introducing yoga classes at lunch and after work – something we are very much in favour of. Art is sometime viewed as a luxury when it comes to office design, something that only larger corporates with deep pockets could contemplate. Consequently, and unfortunately for many offices, the impact of art in the workplace has been significantly underestimated. That is until now and following a slew of studies and articles highlighting the positive effects that artwork can have, more and more companies are embracing artwork through office design. There is an increasing body of knowledge that shows how artwork in the workplace can result in increased creativity and more content staff, and as such has a pivotal role to play when it comes to designing a new office space. Art is more relevant than ever in today’s work office and can take many forms, from traditional framed artwork to feature pieces and in a modern twist, graffiti, and critically, options are now available for all budgets.